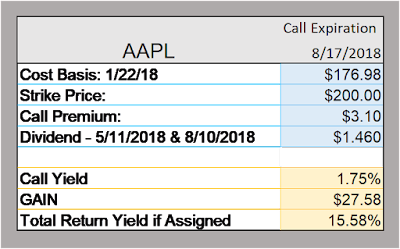 Today, I sold another call on AAPL. I went out a little further than I normally do using an August 17, 2018 expiration date. Going out this far does provide for two dividend payments. One of those has been declared and the ex-dividend date is 5/11/2018. I expect the next quarterly dividend to carry an ex-dividend date of 8/10/2018. The first dividend is $.73 and since the dividend was just recently increased, I anticipate the second dividend to also be $.73. The table below uses my covered call calculator to present the data on this trade. This year I wanted to put capital to work to create income. The stocks in this portfolio are different from my dividend machines. The point is to record and measure how this strategy works out. I have to get 5% income from my portfolio. At 5% I create enough income to make required minimal distributions without having to tap my capital. The table below shows AAPL specifically and the second table shows the total 2018 call portfolio. This portfolio has $68,222 in capital working to create income. Current yield on that capital is over 6%.